Go to ECFR's "Germany in Europe" page, where you can find publications, commentary pieces and podcasts abut the role of Germany in Europe. I've just uploaded the first in a short series (two or three in total) of podcasts with George Soros answering questions from assorted journalists at ECFR's London office. Mr Soros was in the building for a press conference for his new book, "The tragedy of the European Union: disintegration or revival? ", chaired by Mark Leonard. The issues covered in this chunk of the press conference concerned: Germany's solutions to the euro crisis; Scottish independence; the UK's winning strategy of non-euro EU membership; whether the markets or governments would bring stability to the system; central bank stimulus; and the dangers of anti-EU populism in debtor countries. The announcement came shortly before midnight on Tuesday: there will be no ruling coalition between the Greens and Merkel’s Christian Democratic Union (CDU). No-one wants new elections, the Greens and the Social Democrats (SPD) reject the notion of a joint coalition with the Left Party, and Germans almost unanimously dismiss the idea of a minority government by the CDU. So it should be no surprise that SPD and CDU struck a deal today and agreed to formally start coalition talks. The key questions now revolve around who gets what, with the Finance Ministry being the key bone of contention. Current occupant Wolfgang Schäuble is refusing to budge, but the conservative wing of the SPD has already announced that Social Democrat possession of the Finance Ministry is a prerequisite for a "grand coalition". Germany votes: what does Spain think? 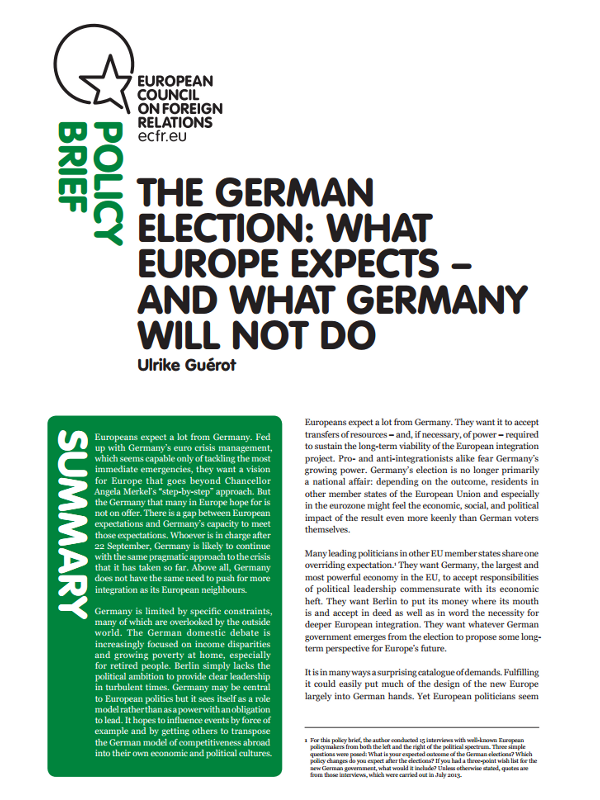 In the last of an ECFR blog series looking at how the German elections are being seen around Europe, we turn to Spain. Germany votes: what does Britain think? In the fourth of this series on how Europe sees the German elections, we examine how Britain feels about the vote. Britain has become comfortable with Mrs Merkel as Europe’s foremost politician. Her sensible demeanour stands her in good stead with a public with an inbuilt suspicion of anybody seen (or supposed) to be peddling greater ambitions for the European Union (as David Cameron’s criticism of José Manuel Barroso bears out). With polls suggesting that she is similarly well thought of among Germany’s voters, most Britons are assuming that things will continue much as they are now once the elections are out the way – notwithstanding residual curiosity over the intricacies of coalition forming, especially after their own recent experience of it.